Take the boys-club crap of the video game internet, put it in a time machine and… you get a funny/sad comic that might just make it a bit more clear just how awful it is for the women who suffer the harassment of unenlightened dudes. 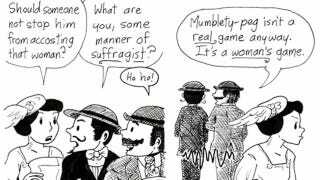 By setting this strip in the early 20th Century, cartoonist Shaenon K. Garrity subversively drives home just how outdated the attitudes behind sexual harassment and hostility are. I chuckled at the sly Yellow Kid cosplay and Nintendo Playing Card Co. jokes in the background and winced at references to recent headlines. But, mostly I was struck by the loneliness the protagonist must feel at not being able to really enjoy a thing she loves.